It has only API classes and interfaces. It has the core implementation of the services which do not have any framework specific code. It provides remote capabilities to the interfaces. It supports time based operation. eg. Timer events, deadlines etc. Interact with services over remote ejb invocation-currently available for JBoss only. Its main responsibility is to deploy or undeploy units. It gives the information of available deployment units and their RuntimeManager instances. 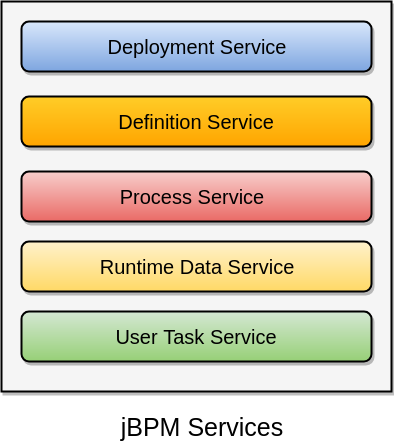 This service refers to the runtime information of Process Instances. It is used as the main source of information.